Construction continues in spite of numerous weather delays. A stretch of No Rain for several weeks would be a very welcomed happening!!! Much of the remaining work is being hindered by the frequent rain storms. Some of the new decking was poured during the week of August 20 and the wading pool forms are being constructed. Work continues on the pool mechanical room: a new steel support beam for the roof is in place, the sidewalls have been reinforced and interior painting has begun. Installation of pool chemical equipment and new electrical service will begin shortly. 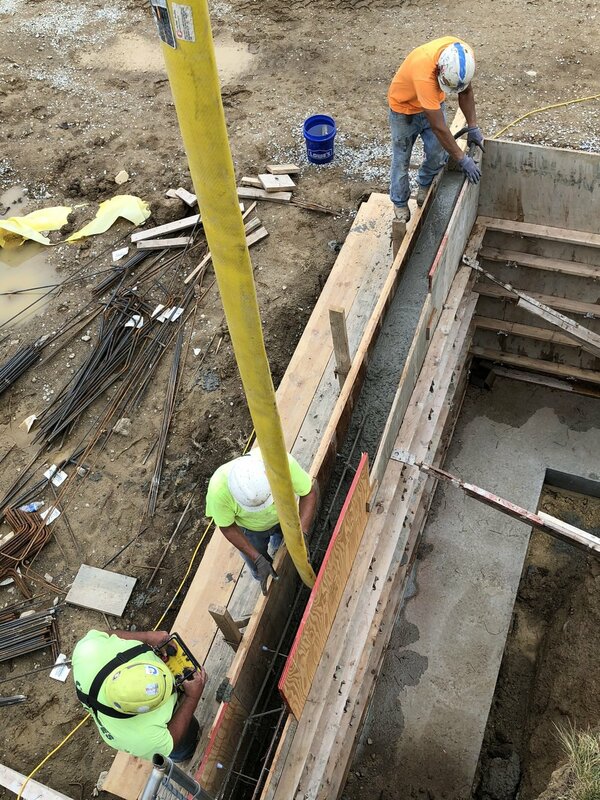 Forms are being constructed for the new retaining walls on the north and south sides of the pool mechanical room. There’s a lot of work yet to be done once the pool is actually completed: testing, testing, testing; grading of the landscape, new blacktop in the lower drop off lot, installation of the perimeter fences, and other related construction details. Once again, Thank You for your patience during the pool construction. Delays occur in every construction project whether a home remodel or a new construction. No one can control Mother Nature and this year she has been unrelenting in causing rain delays. “Good things come to those who wait.” Our new pool will be awesome!!!! Work continues on schedule for the new pool. The main drains will be installed this week (weather permitting) and the forms are being constructed for the walls of the pool. Demolition of old pool began on 4/18 to make way for the new Woodland Springs Pool!!!!! May 22 the floor for the new pool was poured. The new floor is 12 inches thick!!! Sidewall forms are going up, the rebar is being hand tied together this week. The sidewalls should be poured in the next two weeks, weather permitting. So far, everything is on schedule!!! The wading pool is gone!!! The yellow caution tape marks the roof of the pool chemical room. excavating around the room will be "delicate" work in the days ahead so as not to damage the existing walls. Pouring the East Retaining Wall between the Clubhouse and the new Pool deck. Pool Mechanical Room Walls have been reinforced and repaired. Awaiting the application of the waterproof membrane to side walls, then backfilling will take place once that is completed, construction will begin on the wading pool. (Update, Membrane was installed on 7/26. July 1 Pool Update and message . . . The pool project is on schedule. The next weeks will see a flourish of activity as the stainless steel guttering will be welded onsite, the pool chemical room exterior walls and top will be covered with a water barrier membrane, new concrete poured on the top and then the sidewalls will be backfilled with crushed stone. Inside the chemical room much needed electrical replacement will be taking place as well as installation of piping, etc to service the pool. Once the chemical room exterior is completed and the retaining wall built between the new deck area and the clubhouse patio area, R L Turner, general contractor along with Spear Corporation will have excavation done for the Wading Pool. It will be poured and then the pool deck surface will be installed. The new pool is 3700 sq ft vs the old pool which was 3400 sq ft. Even though to many of you it looks small, it is 300 sq ft larger!!! The weather will be a huge factor in the month of July because the pool walls cannot be painted unless the concrete tests below the recommended moisture level for good adhesion. Then the paint has to "cure" for so many days before the pool can be test filled with water to check all connections, etc for leaks. Hopefully, it will pass with flying colors on the first pool fill. When you see the pool full of water, this does not mean it is ready to open. Inspections, inspections, inspections will have to take place before we are approved by the Board of Health. YOU CAN HELP . . .the pool furniture which is currently stored near the tennis courts will need to get cleaned and moved to the pool deck area. Anyone willing to volunteer some time, muscle and energy to help clean and move furniture to get the pool set up for Opening Day? If so, just email the Board of Directors at woodlandsprings3535@gmail to volunteer. It is going to take your help to get the pool open so all can enjoy when opening day arrives. Open Day is yet to be determined due to the uncertainty of July weather. We want the paint to be applied at the right time, the pool filled only after the paint has properly cured, etc., etc., etc. Why, because the job has to be done right so that it is trouble free for many, many, many years to come. We are hoping to host a Grand Opening Celebration in conjunction with the Island Party which is scheduled on Saturday, August 18. If the pool is ready before then, by all means it will be open for business. We need some volunteers to help with the Grand Opening Celebration, if interested send an email to the above mentioned address. Each homeowner will be issued a "key fob" which will give you entrance to the pool. However, there are conditions which will lock some people out - and that is arrearage of your annual assessment. If you are making semi-annual payments and are current you will receive a key fob, but if you are delinquent you will not receive a key fob. That's the rules of the Woodland Springs, Inc. So, if you are in arrearage and want to use the pool and the other amenities of our Common Areas, please get current with you annual assessment. If you need assistance, contact Joe Winship at Kirkpatrick Management to set up payment plans. The Board of Directors appreciates the homeowners of Woodland Springs and know that each of you is anxious for the new pool to be complete. It's been a long time in coming and we are grateful to each of you for the trust and confidence you have placed in us to make conscientious decisions for our community. We know that not all agree with the new pool, but the majority of you voted for it along with the design last year. The Board honored your input in planning the new pool. It is not solely "the boards pool design but the Woodland Springs community pool design." The Board, as you well know, are all homeowners like you. It is a volunteer board and each board member takes their position with utmost responsibility. Woodland Springs isn't just a Board of Directors, but it is a community of homeowners working together to make our community a great place to live. Let's begin now to rekindle the volunteer spirit that was once a vital part of this community. There are many needs, but few people willing to step up and lend a helping hand. Yes, we have a management company that oversees a lot of the maintenance, etc, but it still takes the involvement of homeowners to make a community a strong and lasting one. Volunteering in your own community can be thankless, but it can also be the most rewarding experience you'll ever have. Seeing the smile of a child's face at a Halloween Party, sipping wine and nibbling on cheese at the Wine and Cheese social, making new friends with the Woodland Springers, assisting with the Woodland Springs Swim Team, getting wet and dirty cleaning out debris from the lake, picking up trash as you walk your dog, this is what volunteering is all about. . .helping to make Woodland Springs a better place for each and every resident young or not so young to live and enjoy. So, Woodland Spring, are you ready for the challenge? ? ? ? ? Thanks for allowing me to ramble a bit on a very hot and humid summer afternoon. Oh, I wish the pool were open, don't you!!! !